Car bomb blows up outside a café in Beirut, where many gathered to watch a World Cup game. No one killed but several wounded. A suspected car bomb blew up outside a café near a Lebanese army checkpoint in Beirut late Monday, security sources told The Daily Star. The sources said a suicide bomber blew himself up near an army checkpoint in Tayyouneh, at one of the main entrances into the capital's southern suburbs. 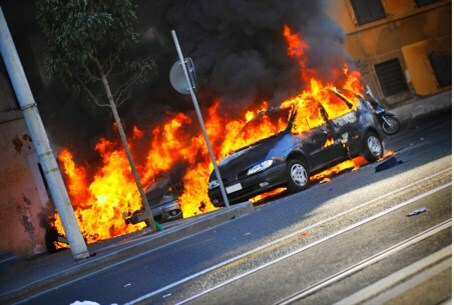 According to the sources, the car was moving against traffic when it exploded, thus confirming that a suicide bomber has carried out the attack. The sources said several people were wounded but no one was killed at the café, where many residents gathered to watch the Brazil vs. Cameroon game as part of World Cup 2014. The Lebanese Red Cross confirmed that the explosion did not result in deaths but several customers of the Abou Assaf café sustained “light wounds,” according to The Daily Star. The attack is the latest in a series of bombings that have hit Lebanon in recent months. A suicide bombing at a police checkpoint on the Beirut-Damascus highway last Friday fueled fears killed a police officer was and wounded 33 people. Hezbollah’s strongholds in Lebanon have been the targets of repeated attacks ever since the group acknowledged sending fighters into Syria to support President Bashar Al-Assad's troops as they battle rebels. Bombings have also hit the mainly Sunni northern city of Tripoli, and ongoing fighting in that city between rival militias supporting different sides in the Syrian civil war have killed scores more.